While exploring spring ephemerals, think about how these fleeting flowers have influenced artists across the centuries. 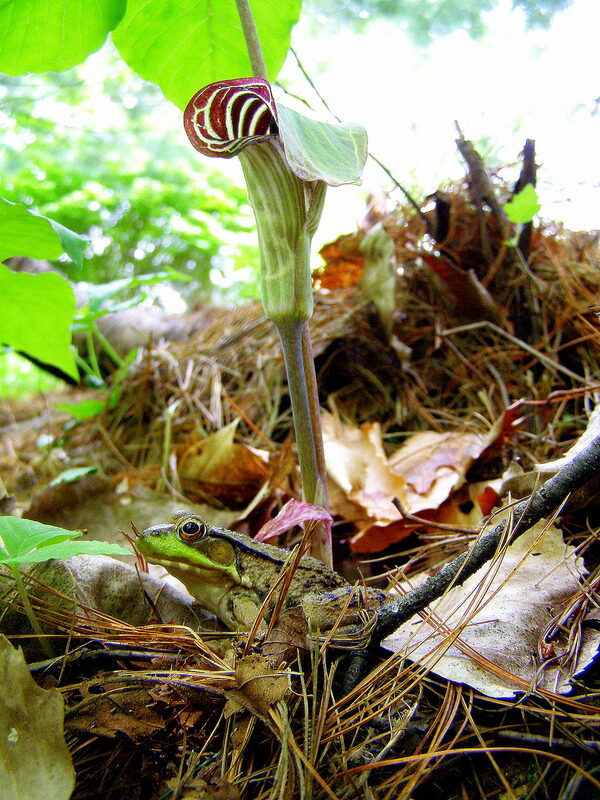 Take, for instance, Jack-in-the-Pulpit, a common spring wildflower that can be seen in the deciduous woods of Western Massachusetts. It is native to the Northeastern United States and flowers from April to June. In 1930, artist Georgia O’ Keeffe created a series of 6 paintings of this flowering plant while on Lake George in New York. The National Gallery of Art owns five of these six paintings. Looking at the painting, how does the artist choose to represent the flower? Remember, this flowering plant is quite small; how does the artist create a sense of drama and intensity that may often be overlooked when coming across the plant on a woodland walk? Are there any other wildflowers you can think of that have influenced artists? Take a moment to consider why flowers are so appealing to humans. Is our attraction to flowers emotional or practical? For the honeybee, flowers are a source of food. What do they signal for humans? Could it be for the same reason? Other reasons? As summer approaches, the buzzing of bees and the appearance of butterflies and hummingbirds reminds us of how these creatures are all part of a symbiotic life cycle that is happening around us in the natural world. Honeybees are an important part of our agricultural system as they pollinate a significant number of crops that we rely on for food sources. They also produce honey, one of the oldest known forms of sugar. In fact, there are cave paintings in the Araña Caves of Valencia, Spain, that include an image depicting a hunter dangerously attempting to gather honey from a cliffside hive. The painting is estimated to be about 15,000 years old and was discovered in the early 1900’s. It speaks to the human fascination with honey and how it was prized as a food source. In early America, the custom of “telling the bees” was practiced as a tradition brought over from Europe. After a death in the family, the beekeeper would “tell the bees” so they too could enter proper mourning. It was thought that otherwise the bees might not produce honey or leave the hive to pollinate our crops. Many poets have been influenced by this custom. John Greenleaf Whittier, a poet previously featured in the September/October Season issue of Learning Ahead, describes the practice in his poem, “Telling the Bees,” and even more contemporary poets, including Deborah Digges and Lizette Woodworth Reese, have also taken the name of this practice to title and inspire their work. there chart the third day’s quickening. Download our May/June edition of Learning Ahead: Cultural Itinerary for Western Massachusetts for embedded learning opportunities found in cultural resources that exist within the geography, history, and cultural traditions of Western Massachusetts. I love Honeybees and Georgia O’keefe! Find your place this summer with our comprehensive directory of summer camps, programs, and opportunities in Western MA! Want to add your listing to our summer directory, the regions go-to online resource for summer opportunities? There’s still time! Welcome to Hilltown Families, an award-winning community-based education network, serving the four counties of Western Massachusetts. Founded in 2005 by Sienna Wildfield, Hilltown Families believes in creating resilient and sustainable communities by strengthening a sense of place through methods of community engagement that supports interests and values. By highlighting the embedded learning found in community-based resources, events, and opportunities, learning becomes inclusive, accessible, and intergenerational while remaining relevant to the learner. When community members are brought together through shared interests, meaningful connections are fostered through a shared history based in community engagement. Awarded the "Essential Agent of Change Award" by the MDPH's Massachusetts Essentials for Childhood, Hilltown Families is recognized as a leading family strengthening initiative in the region, promoting "positive parenting through the social norm of community social connectedness." Thank you to all of our sponsors! Interested in joining our team of supporters? Find out about enhanced publicity with Hilltown Families! 🌸⭐️Spring Holidays, Poetry Month, Earth Day, Baby Farm Animals⭐️🌸 Discover 50 community-based educational events and community building opportunities here in Western MA! Our interest & value cloud for this week highlight spring opportunities to engage in your community while spotlighting learning opportunities for self-directed & lifelong learners throughout the week! 🌸⭐️🌸Peruse our list of seasonal highlights & spotlights for April via link in bio. Learn Local. Play Local. : Peeps to Jelly Beans. Spine Poetry to Easter Baskets. Learn Local. Play Local. : Raptors to Folk Art. Postcards to Pancakes. The Hilltown Family Variety Show (HFVS) airs Saturday mornings on Valley Free Radio, 103.3FM WXOJ, Northampton, MA from 9-10am with encores on Sunday from 7-8am. Playlist and podcasts are posted immediately following broadcast. Listen to our archived shows at any time: HFVS Archived Shows. © Sienna Wildfield, 2006-2019. Unauthorized use and/or duplication of this material without express and written permission from this blog’s author and/or owner is strictly prohibited. Excerpts and links may be used, provided that full and clear credit is given to HilltownFamilies.org with appropriate and specific direction/link to the original content. Photo use and reprint permission inquires may be sent to swildfield@hilltownfamilies.org. Posting a comment to Hilltown Families will automatically add you to the Hilltown Families mailing list to receive our weekly update. Email addresses are never rented or sold. To be removed from our mailing list, email info@hilltownfamilies.org to request to be removed. Information provided on Hilltown Families (HTF) is for informational and entertainment purposes only. Reasonable efforts are made to provide the most accurate information, but no guarantees of any kind can be made. Information can be changed without prior notice. Please check with 3rd parties to confirm all listings for date/time, cost, location and age appropriateness before attending. Opinions expressed on HTF are that of the writer and not necessarily that of HTF. In no event shall HTF be liable (directly or indirectly) for any losses or damages causes (or allegedly caused) in connection with HTF. All health and wellness related information is for entertainment purposes only and should not be used to substitute for professional medical advice or diagnosis. All provided links are provided as a courtesy and not as an endorsement. HTF is not responsible for the content of external websites.